Water quality is one of the most critical factors to the long term viability of your water garden or pond. A lot of people feel that water and pond maintenance in general is a hassle, but it doesn’t have to be. As long as you don’t procrastinate and put off doing what you know you should be doing, you’ll have good results. Below are some tips that will help you effectively filter pond water. Water filters come in three varieties, which are sterilizers, mechanical and biological filters. Sterilizers function by moving water through a tube that contains a bulb which is ultraviolet that eradicates any microscopic living particles. Mechanical filters will trap sediment and debris and then remove them, while biological filters make use of good bacteria to dissolve pond waste, transforming it into compounds which are less damaging which are then used as fertilizer for aquatic plants. To maintain the quality of your pond water, it is highly recommended to use two filter types simultaneously. If you combine a quality biological filtration unit with a good mechanical filter, this will often eliminate the need to use sterilizers. The purpose of a skimmer is to eliminate debris before it can descend to the pond’s bottom and decay. 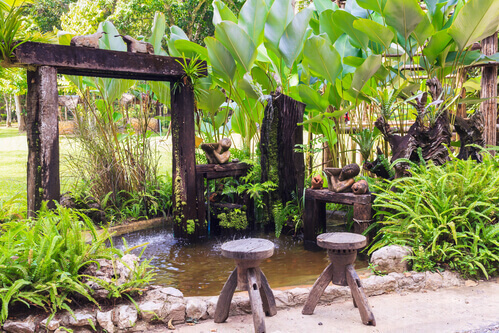 A skimmer will also contain the plumbing and pump, ensuring it is hidden from view which will make your pond visually appealing and natural looking. Another benefit of skimmers is that they won’t cause the pond to drain should a leak occur in the waterfall or plumbing. Skimmers come in two basic forms, which are floating skimmers and box skimmers. Both variants provide filtration by eliminating waste or debris so that it does not descend to the pond’s bottom. The box skimmer has become quite popular in recent years due to its ease of maintenance. It will feature either a horizontal or vertical mat, with the horizontal mat being the most useful. Vertical mats have to be cleaned and monitored frequently to ensure there is sufficient water within the pump chamber to correctly function. Since horizontal mats are flat they maintain their shape and don’t clog to the extent that water is blocked from moving through. Biological filters are hands down the best products on the market and are brilliant in their design. They take in water that has already moved passed the skimmer, and will often be situated on the opposite end of the pond. Once the water goes into the biological filter (usually via a pipe that is flexible), the water will then move from the bottom to top through filter media that eliminates even the finest particles. Once the biological filter becomes full it will overflow and move over the waterfall edge, falling down onto rocks to produce a cascade that appears natural. The waterfall provides the pond with essential aeration.